The review “Kinase Inhibitors: the road ahead” was recently published in Nature Reviews Drug Discovery. In it, authors Fleur Ferguson and Nathanael Gray provide an up-to-date look at the “biological processes and disease areas that kinase-targeting small molecules are being developed against”. They note the related challenges and the strategies and technologies being used to efficiently generate highly-optimized kinase inhibitors. This review describes the state of the art for kinase inhibitor therapeutics. To understand why kinase inhibitors are so important in the development of cancer (and other) therapeutics research, let’s start with the role of kinases in cellular physiology. The road ahead for kinase inhibitor studies. Kinases transfer phosphates from ATP to other specified molecules and are found at most stages in the cell signaling cascade. There are 518 kinases encoded in the human genome, and nearly every signaling pathway involves a kinase catalyzed phosphotransfer step. As a result, kinases provide multiple potential intervention points in cellular signaling networks that have become dysregulated in disease. Because these signaling pathways are altered in a variety of cancers, either upregulated or downregulated, blocking kinases with inhibitor molecules has become an important and growing area in development of therapeutic oncology drugs. Kinases have been studied as potential drug targets for over 30 years. In fact, 38 kinase inhibitors have been approved as therapeutic drugs. Kinase inhibitors have been developed in studies of inflammatory diseases and are now beginning to show potential in clinical use. Tofacitinib, a pan-JAK inhibitor, was recently approved for treatment of rheumatoid arthritis. This was an important milestone, not only as the first use of a kinase inhibitor as an anti-inflammatory agent, but also as proof of concept, showing that a kinase inhibitor can be a safe, efficacious drug for a non-terminal disease. Other JAK inhibitors are being tested in clinical trials for autoimmune diseases such as psoriasis, ankylosing spondylitis and lupus. Degenerative diseases are an unmet need in terms of both a lack of therapeutic drugs and increased incidence in our aging population. Encouraging preclinical results have been reported on the use of kinase inhibitors connected to the unfolded protein response in retinitis pigmentosa, and for angiogenesis in wet age-related macular degeneration (AMD). In AMD, angiogenesis inhibition has been achieved via the VEGF pathway. In the infectious disease realm, a colleague of mine wrote in 2014 about the promise of kinase inhibitors in malaria infection in this blog. Kinase targets are also being explored in viral diseases including Ebola and dengue virus, and also for bacterial pathogens such as the human tuberculosis pathogen, Mycobacterium tuberculosis. The emergence of resistance is a major challenge in the use of kinase inhibitors. In cancers of the blood and lungs, amongst others, relapse is all too common due to the emergence of drug-resistant mutants. Research focused on disease-relevant kinase mutants has enabled development of inhibitors that can prolong patient life. “attaining the selectivity required for pharmacological target validation remains one of the largest hurdles in an early-stage kinase inhibitor project”. Achieving selectivity is also important to avoiding toxicity. Lastly is the challenge to achieve desired pharmacodynamic properties such as drug residence time, which is the time the drug remains bound to the target. Prolonging drug-target residence time may impact the efficacy of the drug. The review paper lists several kinase inhibitor assays, along with their strengths and weaknesses (see Table 4 in the review). One recently developed assay that can be used to assess intracellular kinase target engagement is the NanoBRET™ Target Engagement Intracellular Kinase Assay, listed in the table as “In cell NanoBRET assay”. The NanoBRET kinase assay is used in live cells, where it can quantitate kinase inhibitor (drug) binding with the kinase target, as well as length of binding (residence time) of the drug-kinase interaction. The strength of the NanoLuc® signal and its small size enables measure of interaction at physiologic levels and without interference. Here is an article about the NanoBRET Kinase Assay. The Ferguson and Gray review article contains the very latest on kinase inhibitor studies and is a must-read for anyone working in or interested in the field of kinase inhibitor therapeutics. Ferguson F.M., Gray N.S. (2018) Nat. Rev. Drug. Discov. 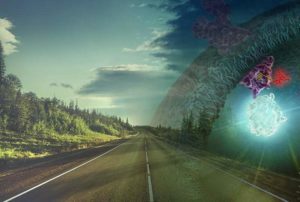 Kinase inhibitors: the road ahead. Epub ahead of print.